Make way for the bride! Have you ever seen a bride more radiant? If you say so, you’re lying! Nkhono Sali’s ululations reverberated high and proud. Her sizable figure seemed to jostle against the powerful wind, her jumps only raising more dust from the barren plain in front of the house. Her traditional doek had fallen to the ground and her unruly hair was spiked up. Her knee-length dress in rainbow colours seemed to go up with the air, revealing much more than intended. But who thinks to pull down an immodest dress when her only granddaughter will be married to the future chief of Moeng village? One by one, the villagers came out and stood in awe as they listened to Nkhono Sali. They all knew the Chief’s son, Thabo, had been on the hunt for a wife ever since his father’s health began to fail. But nobody thought he would go for Busisiwe, Nkhono Sali’s plain granddaughter. They all thought Thabo was after Ma Maria’s gorgeous daughter, Thandeka, because she and Thabo had often been seen together. The village men stood on their stoeps looking at the spectacle that was Nkhono Sali. Some women went to join her in rejoicing, and even the nosy yet shy women could be seen looking out through the parted curtains of their hut windows. The air was full of surprise, and joy reflected on the faces of the group of women who by now were dancing with Nkhono Sali outside her homestead. Across the road, Ma Maria Ntlhaka, a lone figure in black, was hanging out her washing. She glared at the jubilant women with disapproval written on her lined face. Minutes before, Ma Maria had spotted the royal messenger on a horse approaching the Mabuso homestead with a white envelope in his hand. She had imagined that the messenger was merely delivering the Chief’s monthly donation to the poverty-stricken family. But the white envelope contained a plea for Busisiwe’s hand in marriage. And only when Nkhono Sali shot from her house like a lightning bolt, giving happy shrieks, had she understood what the envelope meant. Betrayal was all that came to her mind at that point, for she had been sure that her lovely daughter, Thandeka, had the prince’s marriage proposal in the bag. Her thoughts were bitter: all those strolls to the river, the presents, and the trips to town! Surely it wasn't all for nothing? How could the royal family betray us like this? My Josias must be twisting in his grave, nxa! And Ma Maria stormed back into her modest two-bedroom cement block house, an upgrade compared to the mud huts surrounding it. In the whole village, only the Ntlhakas and the royal family had cement block houses. Ma Maria’s beloved late husband, Josias Ntlhaka, had worked in the mines in Welkom for many years. Ma Maria could still vividly remember her husband’s return. He was wrinkled and thin: rich in wealth but poor in health. Years of debauchery and mining had finished him before he came home as the Chief's trusted royal adviser. The two families had always got along well, and Ma Maria had dreamt of Thandeka as a royal wife to Thabo. It didn’t matter if she was the first or second, as long as she was in the royal house. But it seemed now that her lifelong dream was being threatened by those Mabuso imbeciles. 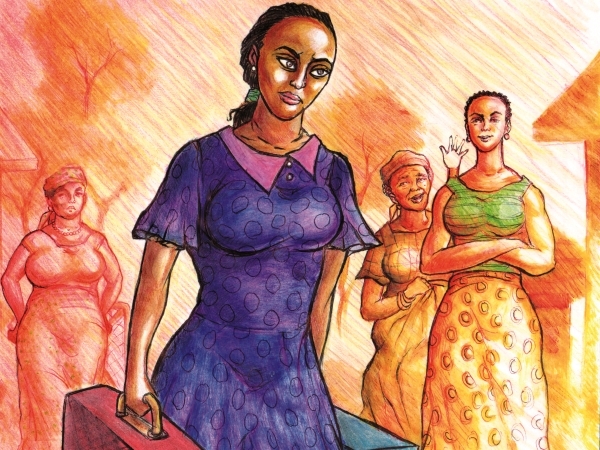 Thandeka heard her mother long before Ma Maria angrily kicked her door open, and she didn't bother to flinch as she knew the exact cause of her anger. Thabo had texted her 30 minutes before, informing her that their charade was finally over. He had got the Chief to approve of Busisiwe, and the royal uncles would soon begin the lobolo negotiations. Thabo had also thanked her for all the days when she had helped him throw the nosy villagers off the scent by spending time together by the riverside. He hoped that the presents that he’d bought Thandeka in town were enough to show his gratitude. Ma Maria burst out with: “Hei oena ausi, while you were sleeping that girl with questionable morals was stealing your man! Get up and go beg him to take you instead!"